The 2009 income tax calculator offers consumers with an assessment of their annual or daily income after their income tax has been taken out. The excel template was constructed, so consumers could evaluate their income without their 401K deductions and other family members pay checks included. The 2009 income tax calculator can be used to assess tax for daily and annual purposes. 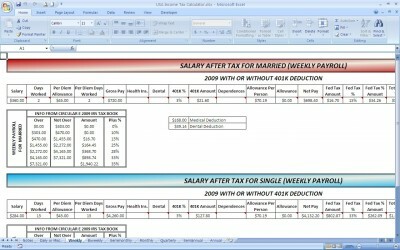 The 2009 income tax calculator was created using excel 2007, so consumers must have excel 2007 and above. This is a good tool to have for consumers who are interested in seeing how much they officially made throughout the year.